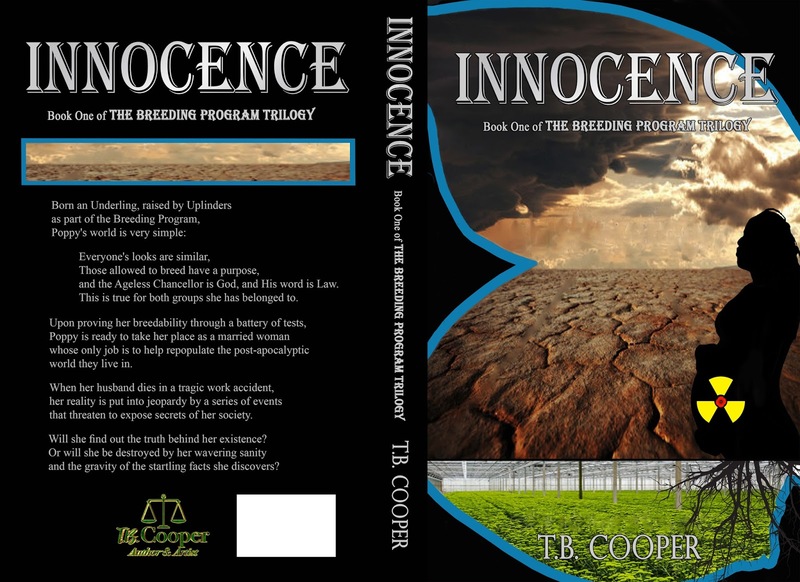 It's Here--Cover Reveal for my NEW BOOK--Innocence (Book #1 of The Breeding Program Trilogy)-- Pre-order NOW for just 99cents--Scheduled for Release March 14th!! This review is for TV Apocalypse by Kathleen Rovner. Plot: The storyline's conflict was/is obvious, just from the title. It's an apocalypse, but not any kind that you'd think of. The premise was new and scary. Being a prepper and 'end-of-the-world' believer, myself, there was a sick morbid enjoyment I had reading this fresh spin (to me it was new) on another type of Doomsday Scenario. Characters: I am not a valley girl by any means, but after finishing the story, I couldn't help but say in a loving higher pitched tone, “Aw, Daisy!” I absolutely LOVED her! A stay at home mom, with two whiny, spoiled children, and a loving husband, has to face her inner conflicts, all while the world outside her front door is disappearing. And a violent threat is lurking in the shadows. Like a ferocious mama bear, she rears up to protect her family, whatever it takes. Even if it means facing judgment by your peers for letting your inner demon make decisions for you in a crisis. The writing: Written in 1st person, from Daisy's POV, the writing was smooth, smooth, smooth from beginning to end. If there were four letter words in there, I'm pretty sure they weren't the really bad ones. I simply don't recall any because I read it so fast. It was written well. In Case You Wanted to Know: There were no sexual acts or inappropriate moments. Nothing to make you cringe. There was implied and mentioned violence, as we know it), but no gory scenes or graphic details. Yes, this story is about the world ending by an (as of yet) unknown source. Yes, there are plenty of questions left to be answered. And yes, I was so upset the book ended, because I wanted more... But it did end at the most logical place possible, the end of Adventure #1, as it were. Overall: I'm starting to see that when reading an apocalyptic story, I expect one 'theme,' to be present, above all the rest. I need to see somewhere in there, that the spark of humanity remains in some of the survivors. That all hope is not lost. I realized that when I finished the book (surprised I finished so fast) and took note that I felt-- lighthearted. I smiled. My dear Daisy's world was turned upside down and destroyed, a false sense of a new security hung in the air over the survivors, and you just know with a Book 2 coming out, that the sequel is ALWAYS darker. It's always worse. But the humanity was there, throughout the entire story. That desire to survive and stay 'good' to others, is the unique element that makes us human. That smile when I finished reading when all seemed bleak? Hope.